A rear shell said to be destined for Apple's anticipated 5.5-inch iPhone was shown off Monday in a new video, with a ruler placed alongside suggesting that previously leaked dimensions of the still-unannounced handset could be legitimate. Physically, the shell appears to be a scaled-up version of the same part on its supposed 4.7-inch sibling and comes complete with internal mounting points and plastic rigging. 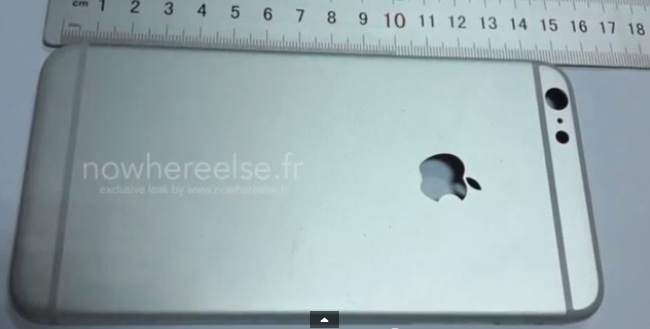 The video shows a length of between 150 and 160 millimeters, and French blog NWE notes that the device could end up bearing the "iPhone Air" moniker. The dimensions line up with specifications previously sourced from what is said to be a computer system at Apple manufacturing partner Foxconn. In those screenshots, the 4.7-inch version measures 138 millimeters on the Y axis, 66 millimeters on the X axis, and 6.9 millimeters on the Z axis, while the 5.5-inch model compares at 158 millimeters, 78 millimeters, and 7.1 millimeters, respectively. Little else is revealed in the new video, and very few parts for the "phablet" model have been seen. Numerous reports, including one from well-connected analyst Ming-Chi Kuo, have suggested that the 5.5-inch variant could be delayed until as late as 2015. Apple will announce its next-generation iPhone lineup at a media event on Sept. 9, with availability likely to follow on Sept. 19, based on the company's recent history. AppleInsider will bring live coverage from the event in Cupertino.